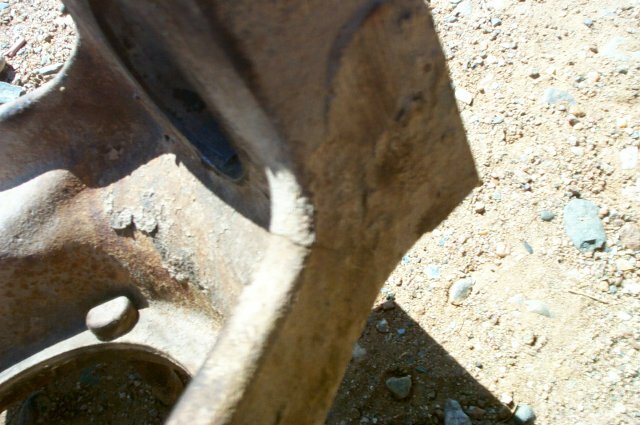 The Ultimate Dana 60 Steering Knuckle? 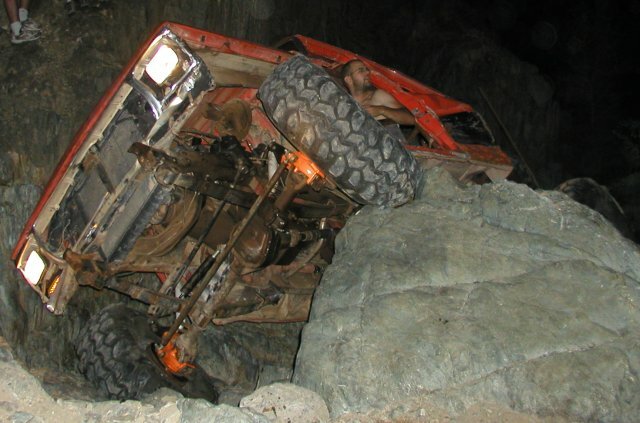 The Dana 60 is unquestionably the most desirable steer axle currently used by rock crawlers. 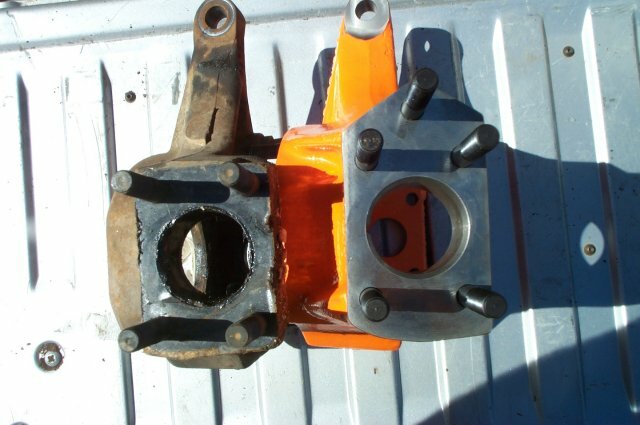 No matter what upgrades are performed on lighter duty units, their strength just cannot be compared to the Dana 60. 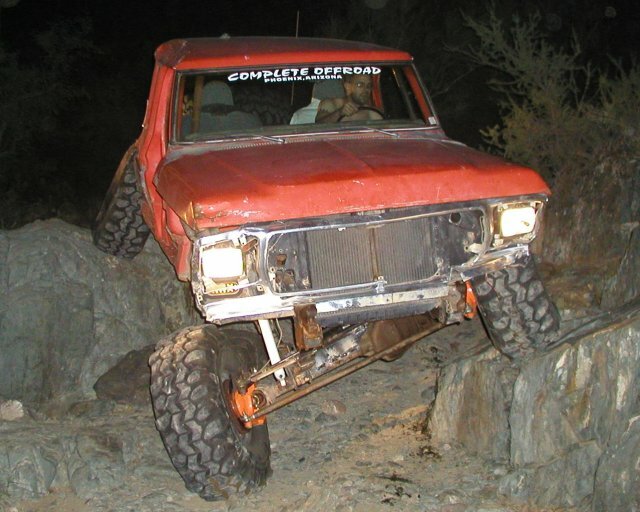 The Dana 60 has been used at one time or another by all three domestic manufacturers under their 1 ton trucks for over 20 years. However since this axle's popularity started sprouting a few years back, the trails we run have further increased in difficulty by leaps & bounds. With the added stress of larger tires and more powerful steering systems many are starting to exceed the limits of even the strongest of Dana's original equipment. In time something must give into the stress, and up to this point the original steering knuckle castings have proven to be the weak point often cracking or breaking just under the steering arm. Below you can see a few examples of the result of large tires with high steering forces on stock components. All of this has caused many people to look towards the aftermarket for components to further strengthen their steering systems. Until recently, the only choices were custom fabricated units from a select few sources. These components have held up well, but due to the amount of time involved in their construction, they have remained very expensive. 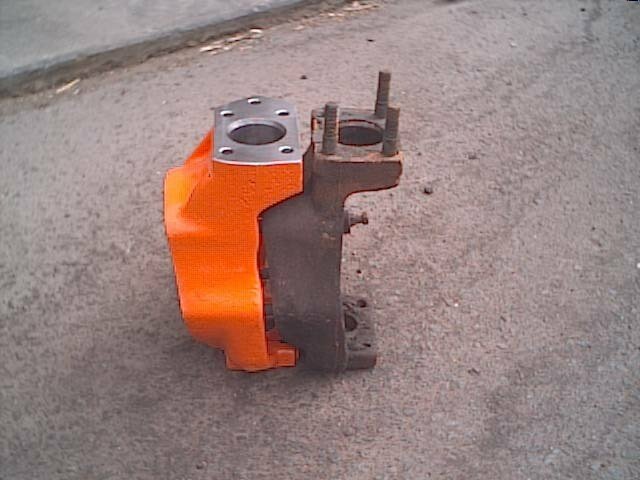 A few companies have researched casting an improved upon version of Dana's original design, but it took Dedenbear Products to develop & release a product to the market that is not only significantly stronger than stock, but available at approximately one third the price of fabricated units. The unit is cast from high strength nodular iron then machined and powder coated. It is considerably thicker in the upper kingpin area where most breaks occur, as well as strategically reinforced throughout. They also thought ahead and took advantage of the added material to add a fifth steering arm stud for greater strength between the steering arm & steering knuckle. They also added a cast in steering stop to help those of us that have been bending the steering stop bolts. Below you can see the Dedenbear knuckle in orange next to a stock GM knuckle. The difference is quite obvious. Installation is no different than installing a stock knuckle (see the Spicer maintenance manual here.) All current four stud steering arms will work with or without being modified to take advantage of the fifth stud. 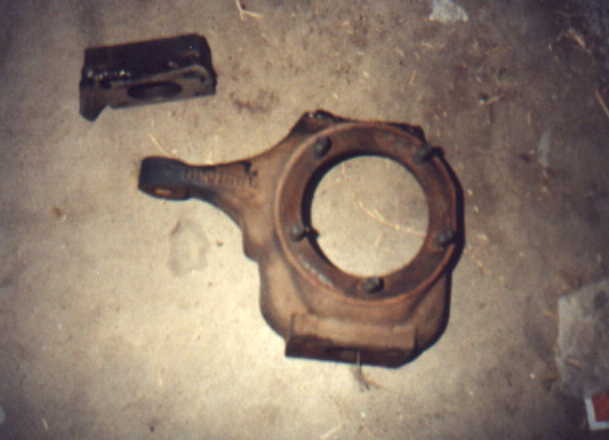 You will also need to grind down the cast in steering stops to the proper point for your application. They are designed to directly replace GM knuckles, but will also work with Dodge spindles & brake components. The only difference between Dodge & GM knuckles is the height of the tie rod arms, which is irrelevant with a high-steer setup, or if the knuckles are replaced in pairs. Ford applications are currently being researched. I have pretty much always had the desire to have a much stronger steering system on my truck, but due to the fact I've broken two, and cracked a third steering knuckle, I was always hesitant about adding any more pressure to a system that could already cause some rather expensive carnage. The type of wheeling I like to do required me to have the ability to steer & hold lines more precisely though. I eventually decided to go to a ram assist setup, but I didn't trust the knuckles to hold up to the added forces so I found myself still being very gentle on the steering. Once I found out about Dedenbear's knuckles, I decided that I really had no choice but to get a set so I could eliminate what was becoming a common & very expensive problem for me. My first replacement steering knuckle was $400 for a brand new one, since I couldn't find a used part anywhere. It broke on me almost exactly 2 years after I installed it. After talking to Dedenbear for a while, and explaining to them the history I'd had with steering components, they asked me to use my truck as a test bed of sorts. They were interested in seeing how their components would hold up to a rig that has proven it can easily break stock knuckles. I did end up installing my ram assist in a way that will put these knuckles to the ultimate test, having the tie rod in the stock location, but the ram is mounted on the drag link which links to the top of the passenger side knuckle. 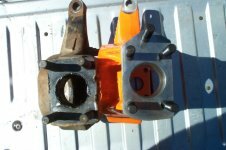 Now some of you may ask how I'm running these on what is obviously a Ford axle, I am running Dodge components from the knuckles out. From the wheeling I've done since the installation, I can almost assure you I would have broken another stock knuckle. I have been doing things I could never do before, like turning from one lock to the other with the suspension fully flexed, nose down, coming off a ledge. 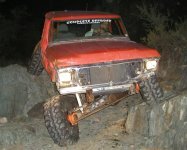 I know some of this probably seems simple to most of you, but keep in mind my rig is about 6000 pounds, very heavily biased on the front axle with 42" tires on 2.5" backspaced wheels. I have been quite paranoid about doing such things for quite some time. I fully endorse what Dedenbear has built for us, and at the bargain price of $259 each it would even be wise investment for anyone running any kind of high pressure steering system just to eliminate any concern of future problems. I will keep you all updated on how they hold up for me, but at this point I have no worries about having any problems whatsoever.